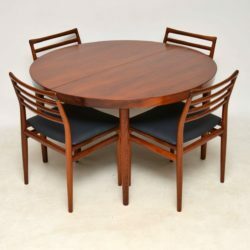 An exceptionally rare and high quality dining suite, this was designed by Robin Day and made by Hille in the 1950-60’s. 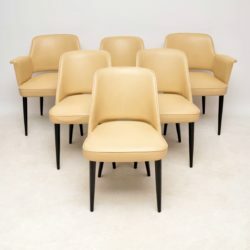 The chairs are all upholstered in cream leather with ebonised wooden legs. They are all in great condition, with only some extremely minor wear. The leather has no rips or tears, it’s all beautifully soft. They may have been re-upholstered at some point. The table has a mahogany top and ebonised wooden legs, there is an extending leaf that unfolds from beneath the top when you slide it apart. We have had the table stripped and re-polished to a very high standard, it’s also in superb condition throughout. 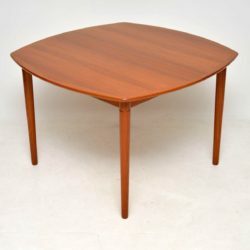 A stunning vintage Danish dining table in rosewood, this was made by Dyrlund in the 1960’s. This model has a very unusual and clever way of opening out, there are four leaves that slide out and unfold to increase the dining area. When closed this seats four, it can comfortably seat eight when opened. We have had this stripped and re-polished to a very high standard, the condition is superb throughout, with a beautiful colour and striking grain patterns. 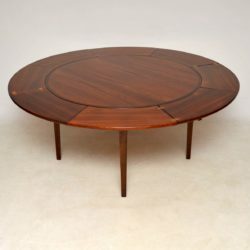 A stunning and top quality Danish rosewood vintage dining table, this was designed by John Mortensen for Heltborg mobler. 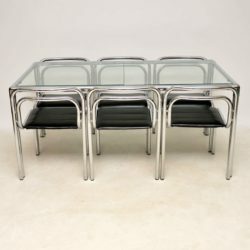 It dates from the 1960’s and is in absolutely superb condition throughout, we have had this fully stripped and re-polished to a very high standard. This has two extra leaves to extend this to a huge size, it can comfortably seat twelve when opened fully, and seats up to eight when closed. 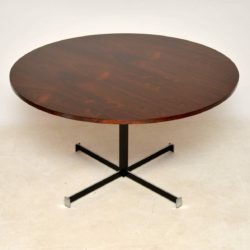 It has a gorgeous colour, and striking rosewood grain patterns throughout, even on the base. 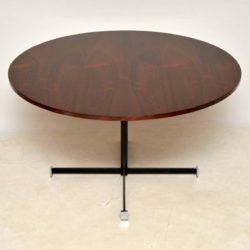 A beautiful vintage rosewood dining table with a large circular top, and chromed steel base. This is a great size and can seat up to six, as the base is a central column, there are no obstructions for chairs. 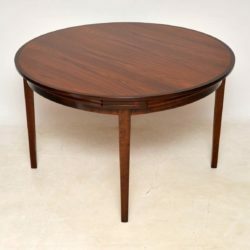 The top has stunning rosewood grain patterns and a beautiful colour, we have had it stripped and re-polished to a very high standard, the condition is superb throughout. 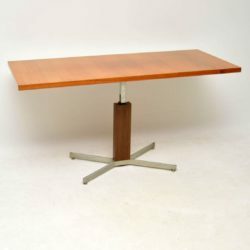 A stylish and iconic vintage dining table, designed by Maurice Burke for Arkana, dating from the 1960’s. 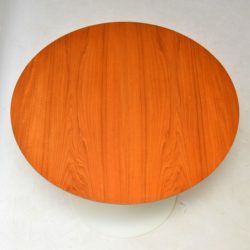 This rarely seen teak topped version has a white metal tulip shaped base, the top is a useful size, big enough to dine from, but not too imposing. We have had the top completely stripped and re-polished to a very high standard, the condition is superb. The white base has been cleaned, a few blemishes remain here and there. 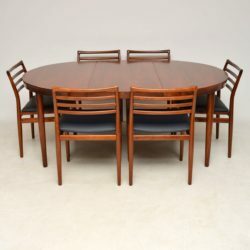 A magnificent vintage Danish dining suite made in the 1960’s, consisting of six solid rosewood dining chairs and an extending rosewood dining table. These were designed by Erling Torvits, and were made by Sorø Stolefabrik. We have had the chairs and table completely stripped and re-polished to a very high standard, the condition is absolutely superb throughout. The seat pads have been newly upholstered in a high quality matt black leatherette. The table has two additional leaves, so seats up to ten people when fully opened. The colour and grain patterns are beautiful throughout, all the chairs and the table are sturdy, solid and sound. The legs of the table easily unscrew and detach for ease of transport. 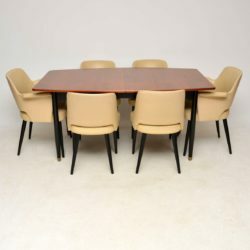 An incredibly stylish and very rare vintage dining table and six chairs designed by Rodney Kinsman for OMK, this dates from the 1960’s. It’s in wonderful condition for its age, all the chrome is clean, sturdy and sound, with hardly any wear to be seen. We have replaced the two square glass tops with brand new clear toughened glass, as the original glass was a little chipped and scratched. It’s now absolutely perfect. The black vinyl seats are also in remarkably good condition, with hardly any wear to be seen. The legs easily unscrew and detach for ease of transport. 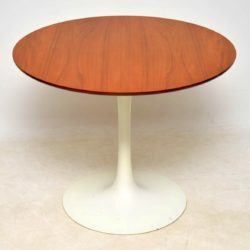 This is an iconic British design, that rarely comes up for sale on the market. 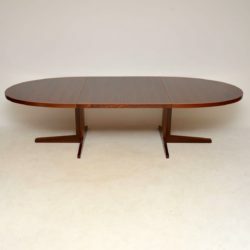 A beautiful and extremely well made vintage dining table, this was designed by Leon Rosen for Pace collection, it was made in the USA during the 1970’s. 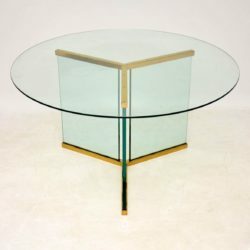 It’s made entirely from glass and brass, the glass on the base is extremely thick and heavy. 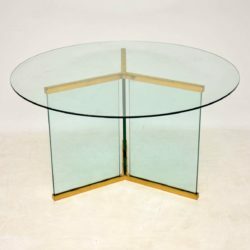 This is in very good overall condition, the glass top has some minor surface wear and a few light marks, nothing too noticeable, there are no chips to the edges. 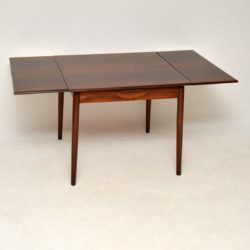 A beautifully made, very useful and versatile converting rise and fall coffee / dining table, this was made in Germany by Ilse Mobel in the 1970’s. It’s a great size, with a very long and narrow top, which rises and falls with a lever mechanism. 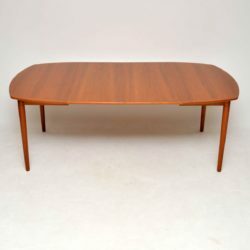 The teak top is in good condition, with some light wear and a few minor marks. The base is veneered in walnut effect formica and has brushed steel legs, with the makers label still visible. 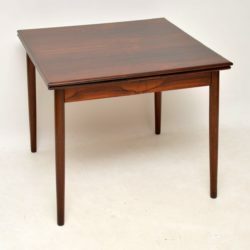 A beautifully made and nicely proportioned Danish dining table in rosewood, this was made in the 1960’s. 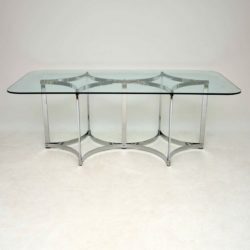 We have had it fully stripped and re-polished, the condition is excellent throughout. It’s a very useful size, with two leaves that slide out from under each side to extend the surface area. This has a lovely colour and stunning grain patterns. 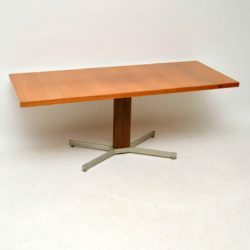 A stunning and very rare vintage extending dining table in teak, this was made in Norway during the 1960’s. 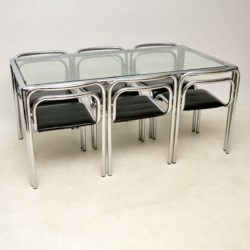 It was designed by Gustav Bahus and made by Rastad & Relling. The quality is amazing, It has a lovely shape with slightly curved edges, and thick tapered legs that easily unscrew and detach for transport. This comes with two additional leaves, it can be used with one or both to extend the surface area. We have had this fully stripped and re-polished to a very high standard, the condition is superb throughout. 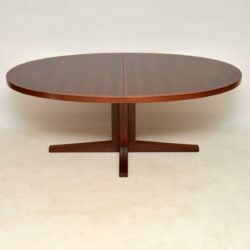 A superb vintage dining table by the high end manufacturer Merrow Associates, this was designed by Richard Young, it dates from the 1970’s. 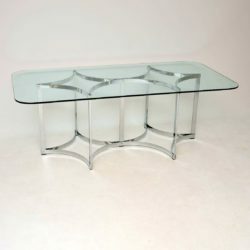 It has a beautifully shaped chrome base, with a large and very thick glass top. The condition is excellent throughout, the glass has no chips, there is just some extremely minor surface wear here and there. Overall this is very clean, sturdy and sound.